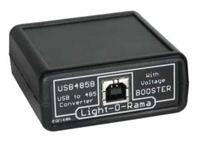 Connects your computer running Light-O-Rama Software to a CAT5 cable that is connected to a Light-O-Rama controller. Plugs into any available USB port. Includes Signal Booster and 6' USB Cable.